Migration rates: New data show global flow of people is steady. The first estimates of global migration shows it’s surprisingly steady. 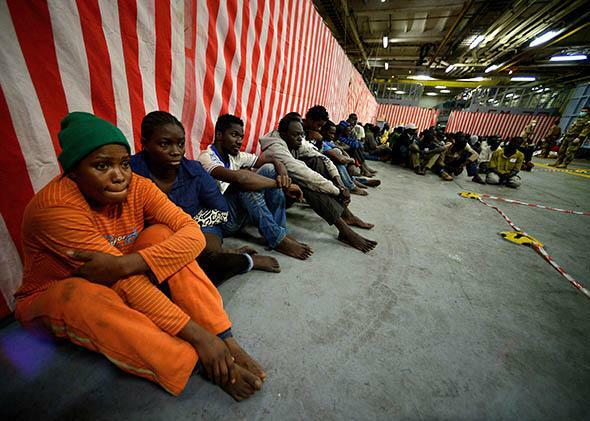 More than 200 migrants sit inside an Italian navy ship after being rescued off the island of Lampedusa in 2013. If you want proof that the modern world is a melting pot, look no further. Streams of migrants moving around the globe have been quantified for the first time and strikingly displayed (see example here) using visualization techniques more associated with genomics. But the figures may surprise many. The overall rate of migration has remained pretty steady, at around 6 people per 1,000 changing their country of residence in each of the three five-year periods between 1995 and 2010. Levels were slightly higher in 1990 to 1995, probably due to conflicts. Reliable statistics on migration have been hard to come by because of mismatched data, with countries using different methods to compile their figures. But last year the United Nations harmonized its data on foreign-born populations in nations worldwide, making it possible at last to reliably estimate recent migrant flows. Jon White asked Nikola Sander, a research scholar at the Vienna Institute of Demography in Austria, who compiled the new figures as part of a study carried out with colleague Guy Abel, to explain their new take on migration. Jon White: What’s unique about the study? Nikola Sander: We’ve produced the first estimates of global migration flows showing movement of people over fixed time periods from one country to another. We’ve done this for 196 countries. In the past we’ve chiefly just had a static measure of people living outside their countries of birth. The lack of standardized measures had meant that migration to and from a given country was typically viewed in isolation. Hence it has been difficult for researchers, the media, and the public to develop a sense of global patterns and trends. JW: How would you sum up your main finding? NS: Contrary to conventional wisdom, our estimate suggests a rather stable intensity of global migration since the early 1990s. We basically measured migration over five-year periods since then and found that 6 out of 1,000 people in the world change their country of residence over each five-year period. It may suggest that globalization has perhaps a more subtle effect on migration than previously thought. JW: You’ve developed striking representations of your results using software more commonly used to map genetic data. What leaps out? NS: Migrants from sub-Saharan Africa appear to have moved predominantly within the African continent. We also see that the largest flow of people was from south to west Asia: This is mainly migration from India and Bangladesh and Pakistan to the oil-rich countries in the Persian Gulf. Comparing the results for regions and countries to the rest of the world in this sort of visual perspective is very enlightening. JW: Does your analysis reveal anything about future trends? NS: With regard to the flow out of sub-Saharan Africa, a subject of much speculation due to predicted population growth there, if there is no expansion in education—which enables people to move to advanced economies that require skilled workers—then Africa will play a less dominant role in shaping future migration trends than for example Asia, where they are rapidly getting more educated. That said, migration is the hardest of all demographic components to predict. JW: Do your results cover illegal migration and the movement of refugees? NS: Refugee movements are included in our estimates when they are taken into account in the U.N. data. But the coverage of refugees in the U.N. data is uneven. However, we believe that at the global scale, illegal migration is playing a minor role. JW: What impact do you hope this work will have? NS: We don’t want to make any judgment about whether migration is good or bad for particular receiving or sending countries. We are just trying to communicate facts and encourage a broad audience to explore the data. If our work brings people back to the facts and allows them to develop their own opinions about what they read in the newspapers, then that will be a step forward. For an interactive version of the data visualization, see global-migration.info.